Mount Assiniboine Provincial Park is a provincial park in British Columbia, Canada, located around Mount Assiniboine. The park was established 1922. Some of the more recent history that is explorable within the park include Wheeler's Wonder Lodge (Naiset) (1924), Assiniboine Lodge (1928), the first ski lodge in the Canadian Rockies, and Sunburst (1928). 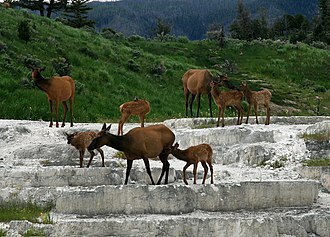 In 1990, this park was included within the Canadian Rocky Mountain Parks UNESCO World Heritage Site. 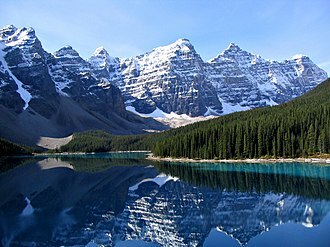 Together with the other national and provincial parks that comprise the Canadian Rocky Mountain Parks, the park was recognized for its natural beauty and the geological and ecological significance of its mountain landscapes containing the habitats of rare and endangered species, mountain peaks, glaciers, lakes, waterfalls, canyons, limestone caves and fossils. 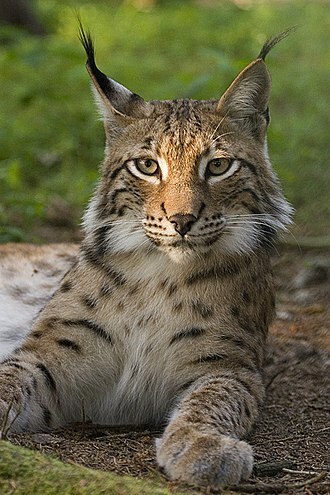 The park aims to protect a large variety of species. Eighty-four species of birds inhabit the park environs, based on sightings. Columbian ground squirrels are very common in the core area of the park. 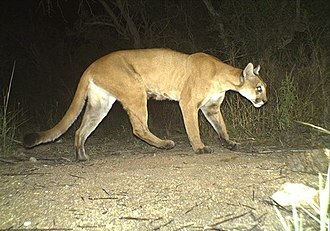 Ten species of carnivore including wolves, black bear, grizzly bear, weasel, cougar, lynx inhabit the park. 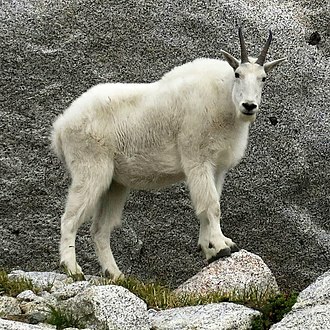 Six species of ungulates: elk, mule deer, white-tailed deer, moose, mountain goat, Rocky Mountain bighorn sheep roam within park boundaries. The following recreational activities are available: backcountry camping and hiking, horseback riding, cross country skiing and ski touring, fishing, and hunting. 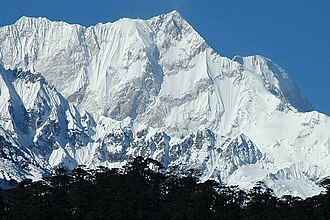 There are also climbing opportunities. Existing facilities include: 10 camping areas (75 campsites), including the main camp at Magog; 6 roofed accommodation sites (60 beds), including Mt. Assiniboine Lodge; day-use facilities at Rock Isle basin, including interpretive facilities and sanitation; 160 km of horse and hiking access trails: Assiniboine Pass, Wonder Pass, Mitchell River, Simpson River, Citadel Pass, Surprise Creek; and guide-outfitters cabins: Mitchell River and Police Meadows. 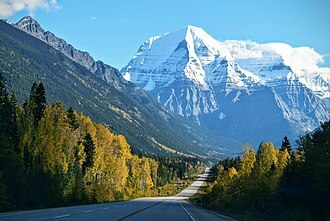 Located 48 kilometres southwest of Banff, Alberta. No roads access the park. Backcountry hiking trails are the only access to the park, the quickest route being via Sunshine Village ski area in Banff National Park. ^ Brooks DeCillia (August 16, 2012). "Historic backcountry ski lodge gets facelift". CBC News. Retrieved August 17, 2012. ^ "World Heritage Committee: Fourteenth Session". UNESCO. 1990. Retrieved 24 June 2012. Wikimedia Commons has media related to Mount Assiniboine Provincial Park. "Mount Assiniboine Park". BC Geographical Names. 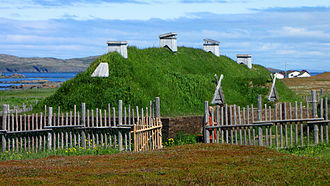 LAnse aux Meadows is an archaeological site on the northernmost tip of the island of Newfoundland in the Canadian province of Newfoundland and Labrador. Discovered in 1960, it is the most famous site of a Norse or Viking settlement in North America, dating to around the year 1000, LAnse aux Meadows is widely accepted as evidence of pre-Columbian trans-oceanic contact. 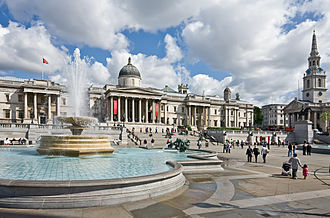 It is notable for its connection with the attempted colony of Vinland established by Leif Erikson around the same period or, more broadly. It was named a World Heritage site by UNESCO in 1978, the site now known as LAnse aux Meadows was first recorded as Anse à la Médée on a French nautical chart made in 1862. The toponym probably referred to a named after the Greek mythological figure of Medea. The cove facing the village of LAnse aux Meadows is still named Médée Bay. How the village came to be named LAnse aux Meadows is not clear. Parks Canada, which manages the site, states that the current name was anglicized from Anse à la Médée after English speakers settled in the area, another possibility is that LAnse aux Meadows is a corruption of the French designation LAnse aux Méduses, which means Jellyfish Cove. The shift from Méduses to Meadows may have occurred because the landscape in the area tends to be open, based on the idea that the Old Norse name Vinland, mentioned in the Icelandic Sagas, meant wine-land, historians had long speculated that the region contained wild grapes. The Ingstads doubted this theory, saying that the name Vinland probably means land of meadows. and this speculation was based on the belief that the Norse would not have been comfortable settling in areas along the American Atlantic coast. This dichotomy between the two views could have possibly been due to the two historic ways in which the first vowel sound of Vinland could be pronounced. In 1960, George Decker, a citizen of the fishing hamlet of LAnse aux Meadows. These bumps covered with grass looked like the remains of houses, Helge Ingstad and Anne Stine Ingstad carried out seven archaeological excavations there from 1961 to 1968. They investigated eight complete house sites and the remains of a ninth, though a possible Norse settlement has been found in southern Newfoundland at Point Rosee, LAnse aux Meadows is currently the only confirmed Norse site in North America. The Rideau Canal, known unofficially as the Rideau Waterway, connects the city of Ottawa, Canada, on the Ottawa River to the city of Kingston, Ontario, on Lake Ontario. It is 202 kilometres in length, the name Rideau, French for curtain, is derived from the curtain-like appearance of the Rideau Rivers twin waterfalls where they join the Ottawa River. The canal system uses sections of two rivers, the Rideau and the Cataraqui, as well as several lakes, the Rideau Canal is operated by Parks Canada. The canal was opened in 1832 as a precaution in case of war with the United States and it remains in use today primarily for pleasure boating, with most of its original structures intact, operated by Parks Canada. The locks on the open for navigation in mid-May and close in mid-October. It is the oldest continuously operated system in North America. Lawrence River, which would have severed the lifeline between Montreal and Kingston, the British built a number of other canals as well as a number of forts to impede and deter any future American invasions of Canadian territory. The initial purpose of the Rideau Canal was military, as it was intended to provide a secure supply, westward from Montreal, travel would proceed along the Ottawa River to Bytown, southwest via the canal to Kingston and out into Lake Ontario. The objective was to bypass the stretch of the St. Lawrence bordering New York, the canal served a commercial purpose. The Rideau Canal was easier to navigate than the St. Lawrence River because of the series of rapids between Montreal and Kingston, as a result, the Rideau Canal became a busy commercial artery from Montreal to the Great Lakes. However, by 1849, the rapids of the St. Lawrence had been tamed by a series of locks, the construction of the canal was supervised by Lieutenant-Colonel John By of the Royal Engineers. Colonel John By decided to create a canal system instead of constructing new channels. This was an approach as it required fewer workers, was more cost effective. The canal work started in the fall of 1826, and it was completed by the spring of 1832, the final cost of the canals construction was £822,804 by the time all the costs, including land acquisitions costs, were accounted for. Joggins is a Canadian rural community located in western Cumberland County, Nova Scotia. On July 7,2008 a 15 km length of the coast constituting the Joggins Fossil Cliffs was officially inscribed on the World Heritage List. The area was known to the Mikmaq as Chegoggins meaning place of the fish weir. Situated on the Cumberland Basin, a sub-basin of the Bay of Fundy and its coal seams which are exposed along the shore of the Cumberland Basin were exploited as early as 1686 by local Acadian settlers and by the British garrison at Annapolis Royal in 1715. The first commercial mine was set up by Major Henry Cope in 1731, but was destroyed by the Mikmaq in November 1732. Samuel McCully opened a mine in 1819 with much of his production being shipped by sea to Saint John, New Brunswick and other markets, large-scale industrialization came to Cumberland County under the General Mining Association, which held the rights to the areas coal fields. Old coal mine working are eroding out of the sea-cliffs at Joggins, recently dendrochronology had been employed to date the timber pit props. A late nineteenth century age has been inferred, with most props dating from the 1860s and 1870s, the coal mines attracted a diverse number of workers, some as young as 12 years. French-speaking Acadians returned from New Brunswick, and were joined by Irish and Scottish immigrants, Joggins Mines expanded rapidly to include three churches, two cemeteries, a hotel, a roller ring, movie theater, fire department, general store, post office, railway station and school. Rail service was abandoned to the community in the early 1960s, the Joggins area was well known in the 19th and early 20th century for the quarrying of limestone grinding wheels, lumber and dairy production. The Bay of Fundy boosts a rich tradition of shipbuilding, in the 1800s, wooden coastal schooners were built on the shore to carry coal and mill stones to the United States. Several of the homes in the Joggins area display the sturdy, practical. Many of the beaches along the Bay of Fundy are still littered with stone ballast from the hulls of old ships, today in addition to tourism, the area is known for the commercial cultivation of wild blueberries and agricultural food processing. The roads and bridges to Joggins were improved in the 1980s and 1990s and area has become popular for tourism, summer homes and retirees. 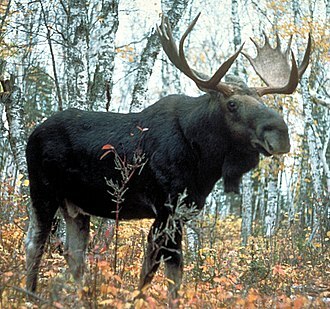 Wood Buffalo National Park, located in northeastern Alberta and southern Northwest Territories, is the largest national park in Canada at 44,807 km2. 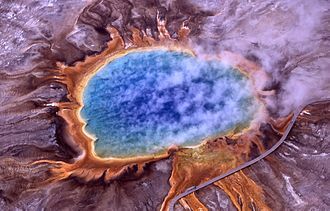 Larger in area than Switzerland, it is the second-largest national park in the world, the park was established in 1922 to protect the worlds largest herd of free roaming wood bison, currently estimated at more than 5,000. It is one of two nesting sites of whooping cranes. The park ranges in elevation from 183 m at the Little Buffalo River to 945 m in the Caribou Mountains, the park headquarters is located in Fort Smith, with a smaller satellite office in Fort Chipewyan, Alberta. The park contains one of the worlds largest fresh water deltas and it is known for its karst sinkholes in the north-eastern section of the park. Albertas largest springs, Neon Lake Springs, are located in the Jackfish River drainage, Wood Buffalo is located directly north of the Athabasca Oil Sands. 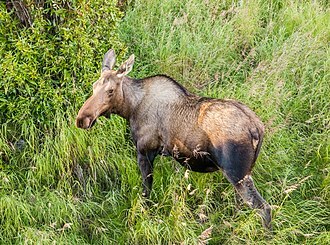 On June 28,2013, the Royal Astronomical Society of Canada designated Wood Buffalo National Park as Canadas newest and this region has been inhabited by human cultures since the end of the last ice age. 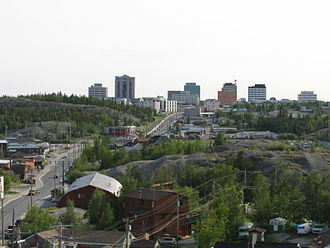 Aboriginal peoples in this region have followed variations on the subarctic lifeway, based around hunting, fishing, in recorded times, the Dane-zaa, the Chipewyan people, the South Slavey, and Woods Cree people are known to have inhabited, and sometimes quarrelled over, the region. The Cree, by contrast, are an Algonquian people and are thought to have migrated here from the east within the timeframe of recorded history. Sometime after 1781 when a smallpox epidemic decimated the region, the two made a peace treaty at Peace Point through a ceremonial pipe ceremony. This is the origin of the name of the Peace River which flows through the region, the became the boundary with the Dane-zaa to the North. Explorer Peter Pond is believed to have passed through the region in 1785, likely the first European to do so, in 1788 fur trading posts were established at Fort Chipewyan just east of the current boundaries of the park and Fort Vermilion just to the west. 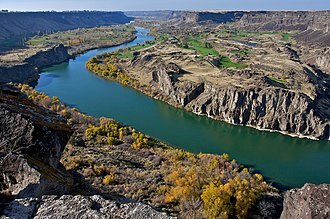 And the Peace River, which had long used by the First Nations as a trade route. The mule deer is a deer indigenous to western North America, it is named for its ears, which are large like those of the mule. There are believed to be several subspecies including the black-tailed deer, unlike the related white-tailed deer, mule deer are generally more associated with the land west of the Missouri River, and more specifically with the Rocky Mountain region of North America. Mule deer have introduced to Argentina and Kauai, Hawaii. The most noticeable differences between white-tailed and mule deer are the size of their ears, the color of their tails, in many cases, body size is a key difference. The mule deers tail is black-tipped, whereas the whitetails is not, mule deer antlers are bifurcated, they fork as they grow, rather than branching from a single main beam, as is the case with white-tails. 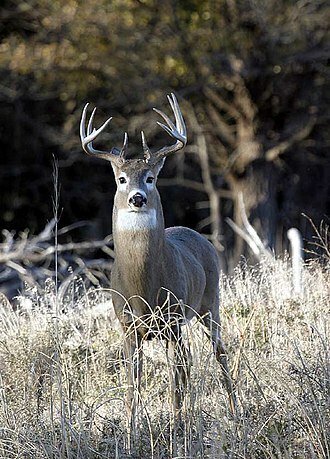 Each spring, a bucks antlers start to regrow almost immediately after the old antlers are shed, shedding typically takes place in mid-February, with variations occurring by locale. Although capable of running, mule deer are often seen stotting, the mule deer is the larger of the two Odocoileus species on average, with a height of 80–106 cm at the shoulders and a nose-to-tail length ranging from 1.2 to 2.1 m. Of this, the tail may comprise 11.6 to 23 cm, adult bucks normally weigh 55–150 kg, averaging around 92 kg, although trophy specimens may weigh up to 210 kg. Does are rather smaller and typically weigh from 43 to 90 kg, an exception to this is the subspecies, the Sitka black-tailed deer. This race is smaller than other mule deer, with an average weight of 54.5 kg and 36 kg in males and females. In addition to related to available shelter and food, the breeding cycle is important in understanding deer behavior. The rut or mating season begins in the fall as does go into estrus for a period of a few days and males become more aggressive. Does may mate more than one buck and go back into estrus within a month if they did not become pregnant. The gestation period is about 190–200 days, with fawns born in the spring, staying with their mothers during the summer, mule deer females usually give birth to two fawns, although if it is their first time having a fawn, they often have just one. A bucks antlers fall off during the winter, to again in preparation for the next seasons rut. 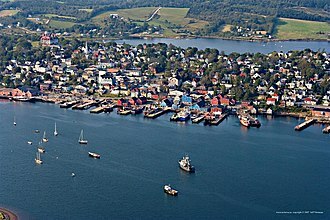 Lunenburg is a port town in Lunenburg County, Nova Scotia, Canada. Situated on the provinces South Shore, Lunenburg is located on the Fairhaven Peninsula at the side of Mahone Bay. The town is approximately 90 kilometres southwest of the county boundary with the Halifax Regional Municipality, the town was established by the three founding fathers, Patrick Sutherland, Dettlieb Christopher Jessen and John Creighton during Father Le Loutres War, four years after Halifax. The town was one of the first British attempts to settle Protestants in Nova Scotia intended to displace Mikmaq, British settlement posed a lasting and certain threat to Mikmaw hegenomy over their traditional territory. The historic town was designated a United Nations Educational and this designation ensures protection for much of Lunenburgs unique architecture and civic design, being the best example of planned British colonial settlement in Canada. The historic core of the town is a National Historic Site of Canada, originally a Mikmaq encampment and clam harvesting site known as āseedĭk, the site became a Mi’kmaq and Acadian village named Mirliguèche for over a hundred years. Mirliguèche is believed to mean milky surf or milky bay, referring to the appearance in a storm. Acadians under the command of Isaac de Razilly established kinship and trade relations with the local Mikmaq, a 1688 census indicates there were 21 at Mirliguèche, in one house and two wigwams, with half an acre under cultivation. 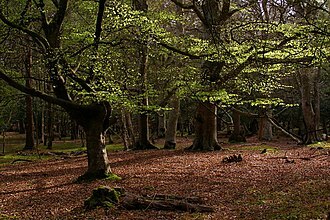 In 1745 there were reported to be only eight settlers in the village, four years later, Cornwallis reported that there were a number of families that lived in comfortable wooden houses. 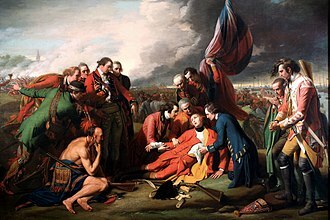 Despite the British Conquest of Acadia in 1710, Nova Scotia remained primarily occupied by Catholic Acadians, Father Le Loutres War began when Governor Edward Cornwallis arrived to establish Halifax with 13 transports on June 21,1749. By unilaterally establishing Halifax the British were violating earlier treaties with the Mikmaq, upon the outbreak of Father Le Loutres War, on October 5,1749, Governor Edward Cornwallis sent Commander White with troops in the 20-gun sloop Sphinx to Mirligueche and had the village destroyed. By 1753 there still was one family in the area – a Mikmaq man named Old Labrador. After establishing Halifax, the British quickly began to other settlements. To guard against Mikmaq and French attacks on the new Protestant settlements, British fortifications were erected in Halifax, Dartmouth, the Natives and Acadians raided the Lunenburg peninsula nine times in the first six years of its establishment. Dissatisfied with the English colonists sent to Halifax in 1749, Cornwallis appealed to the Committee of Privy Council for Trade and Foreign Plantations in London to recruit more Germans, over 2,700 Foreign Protestants signed up for the passage and emigrated to Nova Scotia. Most came from the Upper Rhine area of present-day Germany, from the French and German-speaking Swiss cantons and they stayed in Halifax under British protection while working on the fortifications to pay off the cost of their passage. In 1753, three years into Father Le Loutres War, John Creighton led the group of Foreign Protestants stationed in Halifax to resettle Mirliguèche naming the new British colony Lunenburg. Head-Smashed-In Buffalo Jump is a buffalo jump located where the foothills of the Rocky Mountains begin to rise from the prairie 18 km northwest of Fort Macleod, Canada on highway 785. It is a UNESCO World Heritage Site and home of a museum of Blackfoot culture, Joe Crowshoe Sr. OC – Aapohsoy’yiis – a ceremonial Elder of the Piikani Nation in southern Alberta, was instrumental in the development of the site. The Joe Crow Shoe Sr. Lodge is dedicated to his memory, the buffalo jump was used for 5,500 years by the indigenous peoples of the plains to kill buffalo by driving them off the 11 metre high cliff. These specialized buffalo runners were young men trained in behavior to guide the buffalo into the drive lanes. Then, at full gallop, the buffalo would fall from the weight of the herd pressing behind them, breaking their legs, the cliff itself is about 300 metres long, and at its highest point drops 10 metres into the valley below. The site was in use at least 6,000 years ago, after falling off the cliff, the buffalo carcasses were processed at a nearby camp. The camp at the foot of the cliffs provided the people with everything they needed to process a buffalo carcass, the majority of the buffalo carcass was used for a variety of purposes, from tools made from the bone, to the hide used to make dwellings and clothing. The importance of the site goes beyond just providing food and supplies, after a successful hunt, the wealth of food allowed the people to enjoy leisure time and pursue artistic and spiritual interests. This increased the complexity of the society. In Blackfoot, the name for the site is Estipah-skikikini-kots, according to legend, a young Blackfoot wanted to watch the buffalo plunge off the cliff from below, but was buried underneath the falling buffalo. He was found dead under the pile of carcasses, where he had his head smashed in, Head-Smashed-In was abandoned in the 19th century after European contact. The site was first recorded by Europeans in the 1880s, opened in 1987, the interpretive centre at Head-Smashed-In is built into the ancient sandstone cliff in naturalistic fashion. The centre offers camping and hands-on educational workshops in facets of First Nations life, such as making moccasins, drums. Visitors can witness traditional drumming and dancing demonstrations every Wednesday from July to August at 11 a. m and 1,30 p. m. at the centre, there is now a permanent exhibition at Head-Smashed-In Buffalo Jump. Lost Identities, A Journey of Rediscovery made its first appearance here in 1999, the exhibition, is a collaboration of many historical societies and museums that have given voice to otherwise silent photographs. These photographs have been unidentified for some time, but the exhibit travel led to the Aboriginal communities finding the voice and story behind the photographs taken in these communities. The facility was designed by Le Blond Partnership, a firm in Calgary. The design was awarded the Governor Generals Gold Medal for Architecture in 1990, List of Canadian provincial parks List of World Heritage Sites in the Americas Archaeology of Native North America,2010, Dean R.
Co-discoverer Anne Stine Ingstad examines a fire pit at the site in 1963. Satellite view of the upper Bay of Fundy region, showing Joggins Cliffs and community of Joggins at centre right. Imprint of a fossilized root found near the cliffs at Joggins, Nova Scotia.